Lots of activities planned for Family Day of National Library Week! 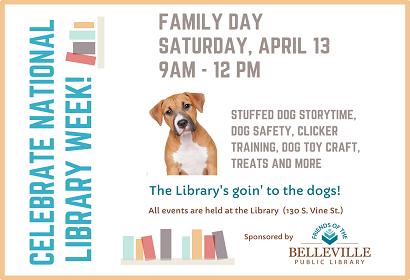 There will be programs on dog safety, clicker training, a dog toy craft you can make for your dog or for a dog in a shelter, we will have treats and more! The Silent Auction also concludes with final bidding closing at 12:30 pm. Sponsored by the Friends of the Belleville Public Library.